Hara hara Mahadevaki stands true to its “A” certificate and delivers a movie filled with adult comedy which lacks a continuous storyline. It’s divided into different segments which barely come together at the end. Based on the adult comedy by whatsapp Swamiji it does attract youngsters who enjoy the most. Gautham and Nikki don’t add any additional flavour to their characters but just deliver what the director asked for. Other cast members join this lazy storyline and run clueless without any direction. Hara hara Mahadevaki fails to exploit the main theme to max and ends embarrassing itself. The movie gets 3 for the attempt on adult comedy. 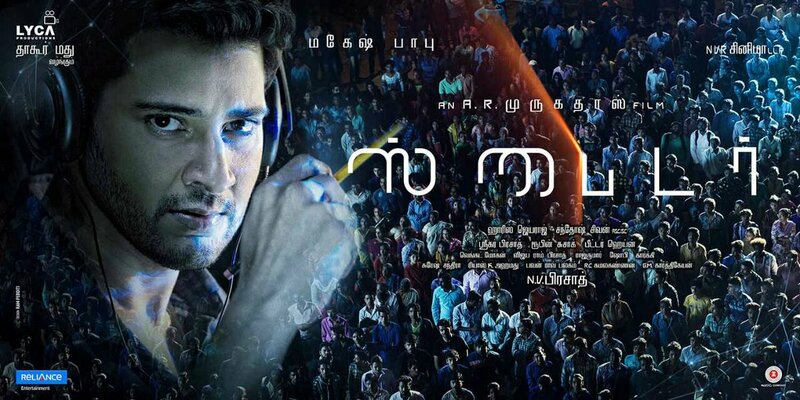 Shiva ( Mahesh Babu) is a junior level officer at the intelligence Bureau who is one of few people working under a special division which taps people phone calls and avoid threats. Shiva who is over qualified for this job goes a step above and plays savior to people who need help. He also creates software which alerts him whenever someone cries for help or feeling scared. On one such occasion he hears to a phone conversation between two young girls, of which one is home alone and feeling scared. He alerts one his close friend and lady constable to go have a look. Next day he finds out that both are brutally murdered and their bodies scattered in public. This incident makes Shiva furious and he begins to hunt the killer. Going deep into the case he begins to uncover a sadistic serial killer who is on the prowl . Who is this Killer? and how Shiva finds him is the rest of the story. 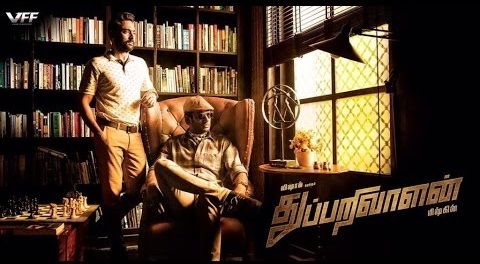 Thupparivaalan a detective action thriller written and directed by Mysskin and produced by Vishal , who also stars in the lead role released this week with great expectation from the director – actor duo who join for the first time. The film starts with some gruesome deaths of two key people in the society. We are introduced to Kaniyan Poongundran ( Vishal) an eccentric detective who takes weird and unsolved cases. When he is looking for an intriguing case, a kid walks into his home with is saved pocket money to find his pet dog’s killer. This pumps up Kaniyan into action, which starts a chain of events which leads him to a murderous group. How he fights them and solves the murder is the rest of the story. Thambi durai ( Vishnu) and Anna Durai ( Soori) are best friends who get together after they were separated in their school days. Thambi Durai who is very cautious and fearful in nature often gets into trouble but finds the easy way out. When he falls in love with Kanmani( Catherine Theresa) and approaches her parents get their approval for marriage. 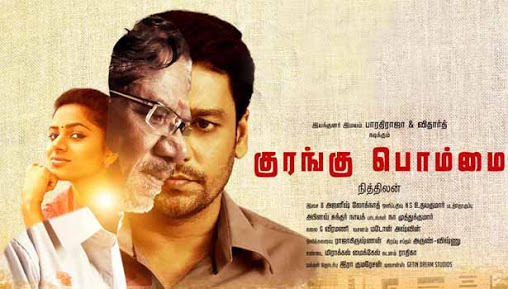 But Kanmani’s father who doesn’t approve of Thambi durai’s nature embarrasses both him and his family . Thambi Durai who wants to marry Kanmani tries to pick fight with the local gang. How this transforms his life is the rest of the story. When movies with mega budget and international locations fails miserably in content and satisfying the audience, comes a decent budget and locally shot thriller Kurangu Bommai by the debutant director Nithilan which keeps us entertained. Sundaram (Bharathirajaa) is a loyal friend and employee of Ekambaram ( PL thennapan) who runs a timber business officially but a full time smuggler. Sundaram’s son Kathir ( Vitharth )work as an on call driver in Chennai and is currently looking to get married. When a high value statue exchanges hands, Ekambaram sends his loyal friend Sundaram for this job to Chennai. This bag with a monkey’s face changes the lives of people who ever touches it becomes the main character in this story. How that happens is the rest of the story. 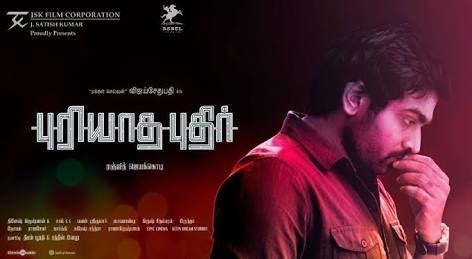 Puriyatha puthir the much delayed film Vijay Sethupathy released this week with very minimal shows. Kathir ( Vijay sethupathy ), Vinod and DJ are close friends from their college days. Kathir is an upcoming music director and is managing a music shop. It’s love at first for Kathir when he meets Meera ( Gayathrie) in his shop. Both get closer and eventually fall in love, but tragedy strikes when Vinod affair with his boss’s wife gets leaked thru a video message , next Kathir gets obscene images of Meera in his phone, and finally DJ gets caught in a drug bust which is exposed thru a viral video. Who is targeting Kathir and his friends and what’s the reason behind all this is the rest of the story.